October 2, 2014 by Ecommerce News. About Cross-border, Launch with tags Switzerland. 24029 views. C&A has expanded its multichannel strategy and integration of online and offline sales channel by launching an online store in Switzerland. Good news for local consumers who want to order something from the Dutch fashion retailer online. A broad campaign has started in Switzerland to promote C&A’s latest expansion. Switzerland is the ninth market where C&A runs an online store. 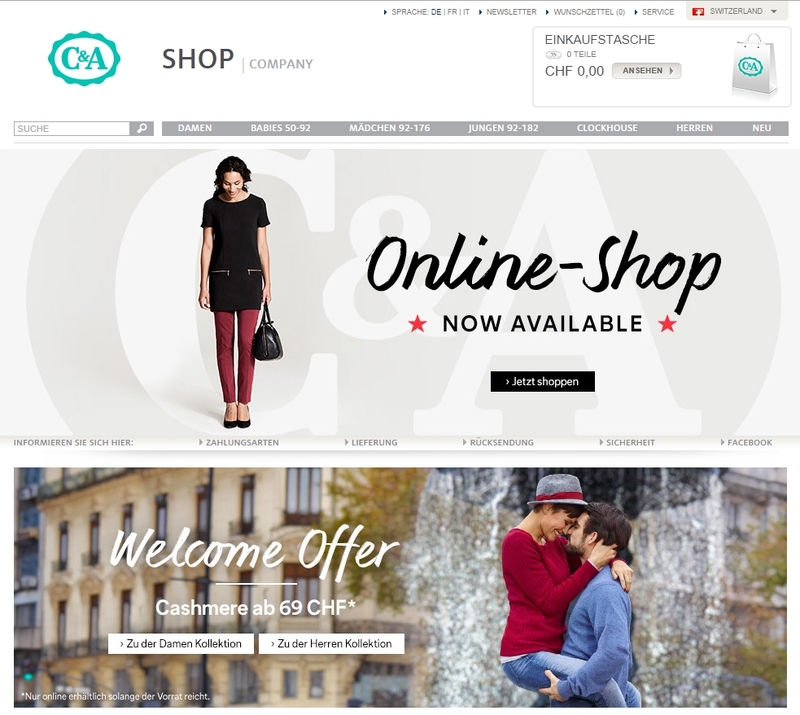 Swiss customers can find the new online C&A shop via www.cunda.ch, www.c-et-a.ch and www.cea.ch. There they’ll find clothes for women, men, children and babies. There’s a national collection, but also some items from the European collection that are not for sale in physical stores of C&A in Switzerland. The Swiss online C&A store offers a clear navigation structure so items can be purchased in a few steps, an optimized zoom function which allows customers to view clothes and accessories in detail, and so-called look books which are filled with outfit recommendations collected by C&A’s stylists. Customers can pay using PostFinance, VISA, MasterCard, American Express or PayPal. They are able to “click and collect” their order, so they can pick it up or return it in a physical C&A store. Once founded in The Netherlands in 1841 by Clemens Brenninkmeijer and August Brenninkmeijer (‘C’ and ‘A’), C&A now operates 1575 physical stores in 21 European countries. It has online stores in The Netherlands, Belgium, Germany, Spain, France, Italy, Austria, Poland and Switzerland.